Join us on Friday, November 9th, 2018 as we lend a hand to our partners at the Forest Restoration Alliance. We will be helping out at the FRA greenhouse and research facility near Waynesville, NC. Activities could include transplanting hemlocks, weeding outdoor growing areas, and cleaning in the greenhouse. Volunteers will also get a tour of the facility by researcher Ben Smith and learn about their efforts to restore hemlocks. 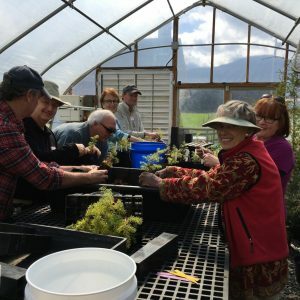 The FRA is a nonprofit group of researchers who work on selective breeding of our native hemlock and fir species for resistance to the adelgids that threaten them. Our volunteer work days with the FRA help to educate the public about the plight of hemlocks and the work the FRA is doing to save them, as well as lending many hands to the FRA staff on some larger projects. The work day will be from 10 am to 4 pm at the Mountain Research Station in Waynesville, NC. To register, please fill out our volunteer sign up form by Friday, November 2nd. More information about the meeting location and what to bring will be provided after registering.